Ex-Armourer Mike Halpin has been involved in a lengthy project to restore a historic former aerobatic team aircraft, Hunter F6 XG194. The restoration of the aircraft has now been completed, and it was unveiled in a ceremony which took place at Wattisham on 14th May 2013. The aircraft led the 111 Sqn Black Arrows aerobatic display team during the world record 22 aeroplane loop at the 1958 Farnborough Air Show and was based at Wattisham from 1958-60. Converted to FGA.9 in March 1965, it went on to fly with 1 Sqn at Wittering. 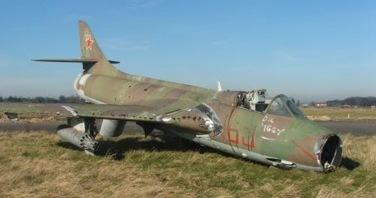 In 1988, after a period at Cosford as a ground instructional airframe, it went to RAF North Luffenham for Explosive Ordnance training, and was painted to resemble a Soviet Sukhoi fighter for crews who would have to disarm Warsaw Pact aircraft that may have been flown to the West by a defecting pilot. In November 2009, the dilapidated frame of XG194 was rescued from a muddy field minus ejection seat, and moved back to Wattisham to be restored to its former glory. Mike was tasked with sourcing a Martin Baker Mk 2H seat for the aircraft and, after a tireless search, located a 1951 seat in Brighton, complete with all original safety equipment. Before the seat could be fitted into the aircraft Mike deactivated all mechanisms, making it safe for static display. The final stage of the restoration was to spray the aircraft in its aerobatic gloss-black colour, as seen while leading the 22 aeroplane loop more than 54 years ago. On 14th May 2013, his 90th birthday, Air Commodore Roger Topp, the former CO of 111 Sqn who led the team and flew the aircraft in 1958, officially unveiled XG194.